in the Cambrian Buildings on Weds. 6th November at 2.0pm. 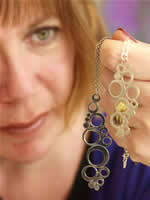 her work is gorgeous and inspirational – skilled, beautiful and sometimes laced with a large measure of fun!!! All welcome – it would be good if you could let us know dianabaur@hotmail.com if you are intending to come, so we can get the right number of tea bags counted out. the door and Sarah’s studio is straight ahead (there is a little kitchen on the right just by her door. Really looking forward to this – see you there!